← Thank Goodness We Don’t Have To Write Letters Anymore, Right Millenials? A few years ago, my now-husband and I were on vacation in Greece, and, as we try to do whenever we go somewhere new, used one night to dine at a really good, fancy restaurant. We had been staying with a friend’s family the rest of that week so we hadn’t been spending much money, and decided to really splurge and go to a Michelin-starred joint on the outskirts of Athens. It was a beautiful place, with a semi-enclosed courtyard and a CHEESE CART (note: write about the etiquette of cheese carts), and we immediately felt very high-class upon entering. We were led to our table, where someone pulled out my chair for me and placed my napkin in my lap, and we were handed menus. 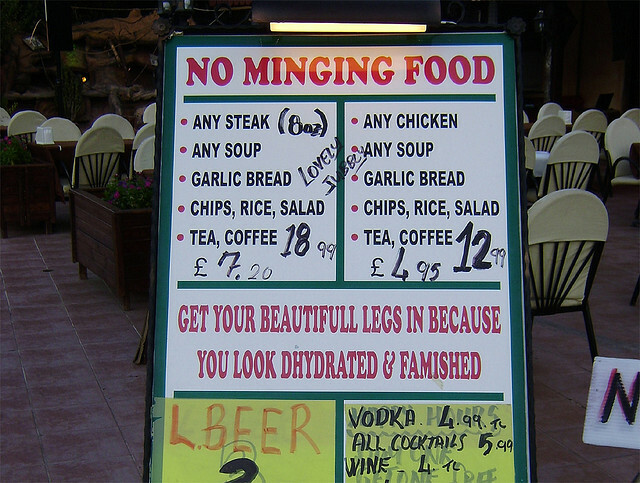 Curiously, I noticed my menu did not have prices listed. “Hey, do you have prices? Is this just how they do things?” I asked my date. Turns out, he did have the prices. Welcome to the concept of the Ladies Menu. The Ladies Menu, one without prices, stems from the idea that someone being treated to dinner should not know what their host is paying for them. You wouldn’t tell guests at a house party how much you paid for all the ingredients in that cake you made, right? Of course not, because they’re your guests and you don’t want to make them uncomfortable about having a lot of money (or a little) being spent on them. Unfortunately, the idea was also that OBVIOUSLY the man would be treating a woman on a date (and obviously a man and a woman out together was a date, and obviously two men or two women would never date, etc.). The concept works with limited success. Women were often taught to predict which dishes would be mid-range options, to avoid upsetting their dates by ordering too richly. Also, occasionally the “host” would forbid the guest from ordering certain things that were too expensive, defeating the point. And nowadays, given that most restaurants post at least sample menus online, can’t you just figure out the average prices beforehand? Or am I the only one that will spend all afternoon before a dinner trying to figure out what I want to eat? …I recall the irritation of a friend of mine, a high-powered BBC current affairs presenter, whose attempt to treat her husband to a special birthday dinner at La Tante Claire was foiled at every turn. Even though she’d made the booking, the staff treated her as the little lady guest. She got the menu with no prices. He got the wine to taste. She requested the bill. He was given it to pay. As they were leaving, the manager asked if she’d enjoyed her meal. It was lovely, she said, but as she was paying for her husband, it would have been nice if they’d treated her as the host. The manager’s face broke into an incredulous smile, and he turned to my friend’s husband. “Lucky fella!” he breathed. Restaurants giving priceless menus to ladies is dying out, though some restaurateurs do note the need for priceless menus. For instance, if one person is hosting a group at a restaurant, they may not want their guests to see the prices, and that is totally legitimate! But let’s be thankful that most women get to know what they’re paying for their own dinner. I don’t eat anywhere upscale enough to have some of these gendered differences — no ladies’ menus, no wine tasting — but the bill thing has been driving me crazy lately. I’m the breadwinner currently while my husband stays at home, so if we go out, I’m nearly always the one paying, and half the time it goes like this: I ask for the bill; they hand it to him. I take it from him, hand it back to them with my card, which has my clearly-female name and, if I’m using my debit card, even my PICTURE on it; they take it away, run the card, bring it back and hand it to him to sign. Not that I expect them to pay super-close attention to whose card it is, necessarily — but if you’re not going to glance at the name/picture, could you just set it down neutrally in the middle of the table? That is incredibly frustrating! With a picture even! I travel some for business and notice that many nice restaurants in the South will take ladies’ orders first and serve them first. If they’re REALLY good, they’ll also serve from the left and clear from the right. Another one, usually in cafes: I order a coffee, my (male) fiance orders a hot chocolate, and then when they’re brought to the table he gets my coffee and I get his hot chocolate, because apparently they think coffee is ‘manly’ or some other fairly sad reason? One of my sweeties loves fruity and sweet drinks. I’m a scotch and beer kinda lady. This sort of thing happens all the time to us. We even try to see if it will happen as a joke on occasion.